Umang island is a tiny island in Sunda strait. It is only 4.5 hectares. Nowadays, it has become a beach resort and spa, which offering a beach holiday in an island. The concept of a beach holiday in an island really intrigued me. It because although Indonesia is an archipelago comprises thousands of islands, there are only few small islands developed into beach resorts. This resort offers several packages for family, prewedding photo shoot, honeymoon and company outing. Each package has different rates for weekday, weekend, long weekend and high season. Thus, I bought a family package when we went there on August 2010. The package consists of 2 nights stay for 4 persons in one room, including 6 meals for each and a boat trip to Oar island. This is a much cheaper deal than the published rate. The hotel provides 2 single spring beds as extra beds, which is quite comfortable. Although the hotel provides the meals, it’s better you bring some snacks too, because there is not any snack kiosk in this island. 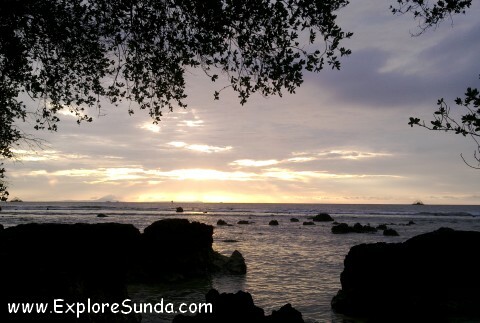 You can see both sunrise and sunset in Umang island, if the weather permits. The distance between these two areas is less than five minutes walk. Since the cottages are built around the island, you can choose to stay in the sunrise or sunset area. Personally, I prefer the sunrise area, because there is a beach in front of the cottages. We can swim or ride a banana boat here. Although the beach looks like a white sandy beach, it actually consists of corals. It is a bit sharp to walk on bare feet, but on the other hand, there are many beautiful shells among these corals. Unfortunately, this beach resort is not yet completely built. The inner grounds are still covered with trees and bushes. I hope they will soon built a garden there to make it more beautiful. I suspect that’s where the mosquito come from. So, another important thing to bring is a mosquito repellent, either lotion, or spray, or electric, because there were many mosquito when I was there. It’s depending on the weather though, because my uncle told me when he was here, there wasn’t any mosquito. Nevertheless, the hotel provides the spray and lotion of mosquito repellent, but I prefer the electric one so I can turn it on all night long. This year we experienced anomaly weather all over Indonesia. Hence, it is still raining and windy in this island on early August, while it should be dry season. Is There Any Hermit Crab in Umang Island? Umang is an Indonesian word for a hermit crab. Other Indonesian words for this creature are Kumang or Kelomang. They live in the shore of tropical beaches. Hence, there are many varieties of hermit crab in Indonesia. 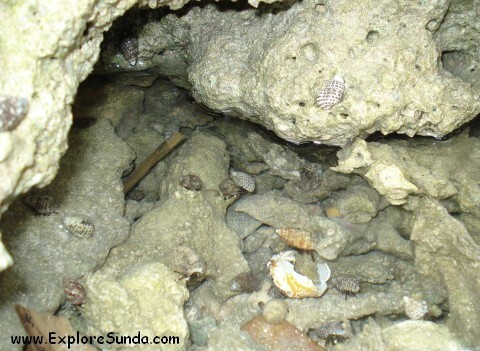 Thus, the name of Umang island made me curious whether there is any hermit crab live in this tiny island. That's the first thing I searched when I arrived. The first day was spent without seeing any of this little creature. The next morning we circled the island. It only took less than half hour to do so. It was during low tide, hence, there are many rocks seen in the beach. We could see some fishes swim lazily in the shallow water surrounding the rocks. Under one rock we found many small shells, which turned out to be the hermit crab I was looking for! Wow, this creatures were amazing. There were hundreds of them, but they were very small. I never saw this variety before: black body, blue eyes and white claw. Imagine you stay in an island far away from city civilization. I bet your spontaneous question would be: What can we do here? Swimming. The basic facility that a hotel can offer is always be a swimming pool. 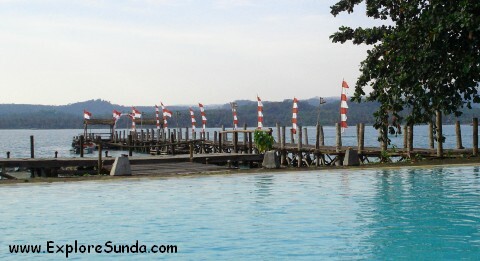 Here the swimming pool is located in open air near the sea. So, you can see beautiful scenery while you are swimming or relaxing in the jacuzzi. Snorkeling at Oar island. This is a must do activity here. There is a beautiful coral reefs with lots of fishes in Oar island. You can bring your own snorkeling gear or borrow from the hotel. There are few guides who will show you the place as well as guard you while you go snorkeling there, so it’s safe. Even you can see the fishes swim around the rocks near the beach during low tide. Alternatively, you can just walk along this tropical beach looking for some beautiful shells. Play pool / billiard. You can find the pool table in the function room behind the reception office. Table Tennis. You also can find the tennis table in the function room behind the reception office. Karaoke. Every night you can sing a song or two in the dining room. The karaoke is available after dinner. Watching the stars in the sky. It is difficult to see stars in the sky when we are in the city due to so many other lights there. But in the place so quiet such as Umang island, we can see many stars when the sky is clear. We can just sit and relax in the patio or garden, watching the stars in the sky and listening to the waves nearby. Company gathering and outbound. Many companies from Jakarta arrange company gathering and outbound here. The hotel provides meeting rooms as well as manages the outbound. Usually the outbound takes place in the Java island, but it is still in the nearby area. Family outbound. Outbound is a great activity to strengthen teamwork and bonds between the participants, which is not only suitable for employees in a company. Hence, you can also arrange a family outbound here. Row a boat, or even row a traditional fisherman boat. The waves surrounding Umang island is relatively calm, hence, it is suitable for this kind of sport. Deep sea fishing in Sunda strait. Many people loves this sport, unfortunately I never try it because I easily get seasick. Ride a banana boat. This is one of the most fun activity for the whole family, especially when the boatman turns the speedboat sharply and the banana boat turns upside down. If you want to ride it or watch how the passengers fall into the water, the banana boat stands by in the sunrise area near the swimming pool. All of the above are things you can do in Umang island. As you can imagine, the bigger your group the merrier and memorable your stay in this island. 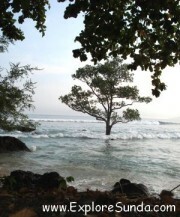 From Jakarta you should go to the village of Sumur, which is near Ujung Kulon National Park. The distance is approximately 200 km. The first 71 km is via toll road, exit at Serang Timur toll booth. The rest of the journey is challenging since it is a small road connecting several small towns and in some points they are not in good condition. Hence, it usually takes 5 hours from Jakarta to Sumur. Since Umang island is rather secluded, a Guest Relation Officer from the resort will keep contacting you during your travel, to make sure you drive on the right track. When you have reached Sumur village, he will guide you to the resort’s parking lot. The porter will pick up your luggage and off you sail on a speedboat to the island. That’s the story of our journey to Umang island. We have a good time there, but I think if we went in a bigger group it will be merrier.